Marek Tryzybowicz was born in Warsaw. After studying Architecture at Technical University of Warsaw he moved to United States to study at The University of Texas at Arlington School of Architecture and in 1988 gained a Master’s Degree in Architecture. After graduation Marek was designing with Hellmuth, Obata and Kasabaum (HOK) Dallas for sixteen years and later, as Vice President and Design Director of HOK Berlin and Warsaw. Marek was designing landmark office-, retail- and multi-functional developments in USA, Asia and Europe. 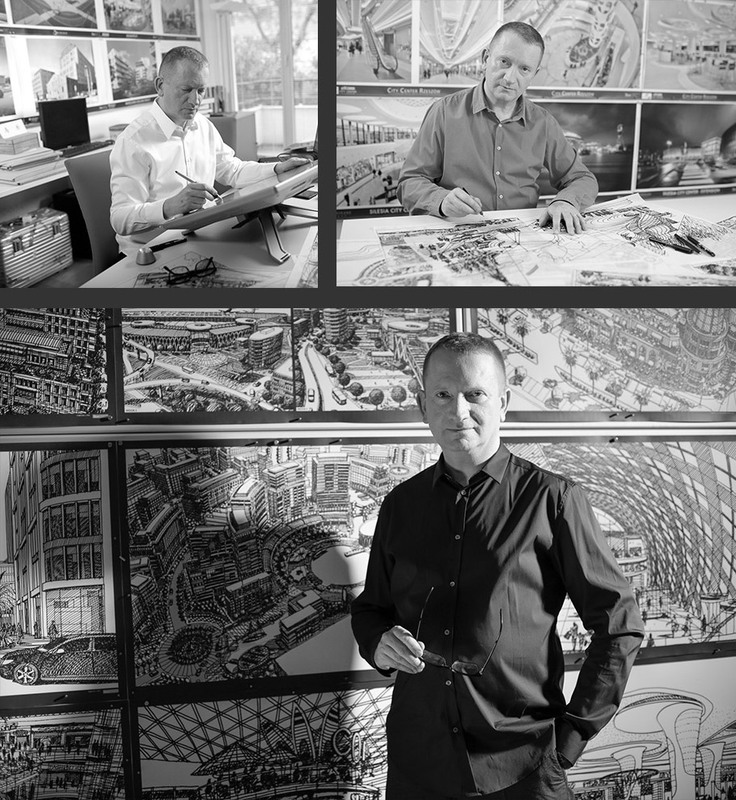 In 2002 he co-founded Bose International Planning and Architecture, now international architectural MTDI Group with offices in Warsaw, Dubai, New Delhi and Santa Fe with projects in 23 countries in Europe, North America, Asia and in the Middle East. Over the past twenty nine years Marek has designed architectural concepts of realized, award winning, masterplans, large multifunctional retail, office, residential and entertainment based developments in Europe, Middle East and Asia. In 2006 Marek was appointed in design director capacity by Dubai based MAF Shopping Malls LLC (“MAFSM”) until end of 2008 to provide Bose International concept and master planning services on MAF portfolio of retail mix use projects in the U.A.E and in the Middle East Region. Marek’designed key European projects include: Nimbus in Warsaw, Poland, Eurovea in Bratislava, Slovakia; Palladium in Prague, Czech Republic; Poznan City Center and Integrated Transportation Center in Poznan, Poland; Galeria Korona in Kielce, Poland; Maritimo Shopping Center in Constanta, Romania; Silesia City Center , Silesia City Center extension in Katowice, Poland; Bonarka in Cracow, Poland, Galeria Amber in Kalisz, Poland and revitalizations of Klif Shopping Centers in Warsaw and Gdynia, Poland. The realized concepts in the Middle East include: Alexandria City Center Extension in Egypt and Deira City Center Refurbishment in Dubai, The United Arab Emirates. The realized designs in India include: Rohini Commercial Rohini, Orchid Agora, Delhi and Noida Commercial, Noida. Since the beginning of 2012, Marek is also leading BI concept design services for multifunctional developments in China. Marek Tryzybowicz is registered architect in Germany and Poland. The Exhibition was a part of "First Stage Of The Sound Investment" THE THIRD EDITION OF THE CONFERENCE "PROJECT INVESTOR" in IBB ANDERSIA POZNAN HOTEL on 13.10.2015. CEE Summit 2017 - Investing in New Europe – cities, sectors, development and capital markets. Marek Tryzybowicz gave a lecture about “Phoenix from the Ashes: Revitalization & Regeneration” at Sofitel Warsaw Victoria Hotel on 29th June. Projekt Inwestor Conference - Innovation as a response to the real estate sector and construction for the need of innovation. Marek Tryzybowicz is a panelist during Projekt Inwestor panel discussions. The event is held on the 42 floor of Warsaw Spire on 1.12.2016. 7th Annual ABSL Conference Transforming Ourselves. Changing the World. Marek Tryzybowicz was one of the speakers on 7th ABSL Conference. The event was held at The International Conference Centre in Katowice, Poland on 28-29 June 2016. Marek Tryzybowicz was a panelist during 4 Design Days panel discussions. The event was held at The International Conference Centre, Katowice in Poland on 11-14.02.2016. “High Streets - Missing Formula in the City Centers. Quest for shared Vision” on January 14 at PROM Kultury Saska Kępa. Marek Tryzybowicz lectured and had a presentation on “Commercial Mix Use Developments - Evolution as a Result of Economic Changes and Increasing Attractiveness for the City Centers”. Materials presented on this site are property of Marek Tryzybowicz and should not be copied without permission.